The standard bearer, and vanilla essence of Arabian dips. It is made from boiled chickpeas, pureed and flavoured with tahini- sesame seed paste, olive oil, lemon juice. Variations range from chunky to smooth, made with freshly boiled or tinned chickpeas, served simply or elaborately with olive oil and paprika for colour. 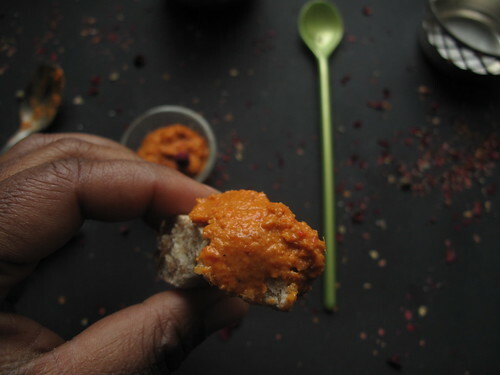 My life hasn’t been the same since paths crossed with Muhammara – smoky, nutty and choc full of flavour, this red pepper tip is one of my favourite Arabian dips ever. The best versions combine roasted red bell peppers, processed with toast bread, walnuts and pomegranate molasses which lend a sweet and sour flavour to the dip. Variations include using canned red peppers – I advice rinsing the peppers as the preserving liquid is quite tart. I’ve made it with both almonds and walnuts – with what I had at home. I love. The version I tried was thinned with yogurt but still contained Tahini and garlic and the smokiness of the grilled eggplants. For me, Toum was the star of the show. Beautifully white, deeply garlicky, this sauce is creamy and smooth and I was totally blown away by the colour. So pure and clean and inviting. Think of it as a garlicky version of aioli. The version I tried was perfectly made – light to taste, smooth and a perfect companion for chicken, and fries and pita. Lara introduced me to this at Barracuda, where we slathered it on grilled fish. Light, tangy and herby – this combination is great with rice as well. As I discovered, not to mention easy to out together. 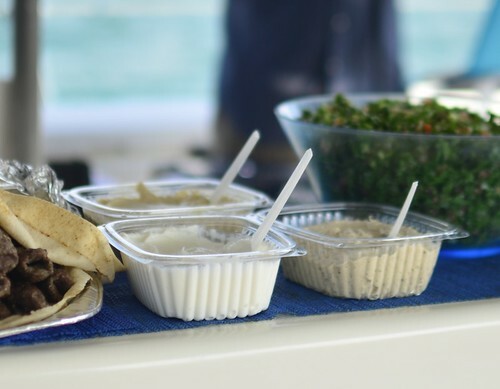 What are your favourite ‘Arabian/ Levant’ dips? And why? What do you serve them with? I’m looking for more additions. Muhammara…How do I love thee?